We’ve got a brand new sword cane for you that you’re not going to want to miss out on! This brand new .50 Cal. 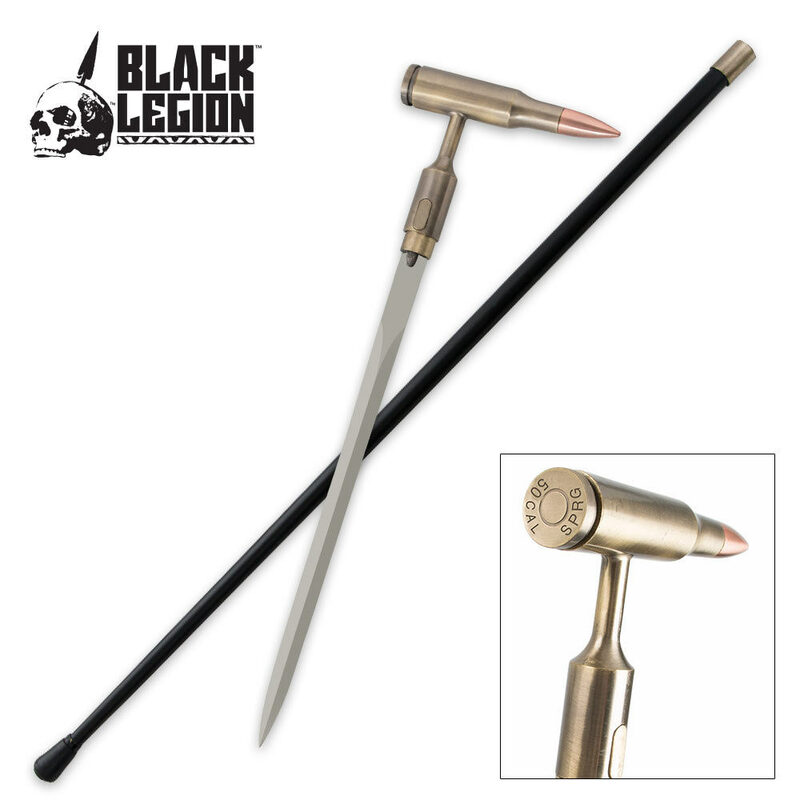 Sword Cane features a brass-plated .50 Cal. 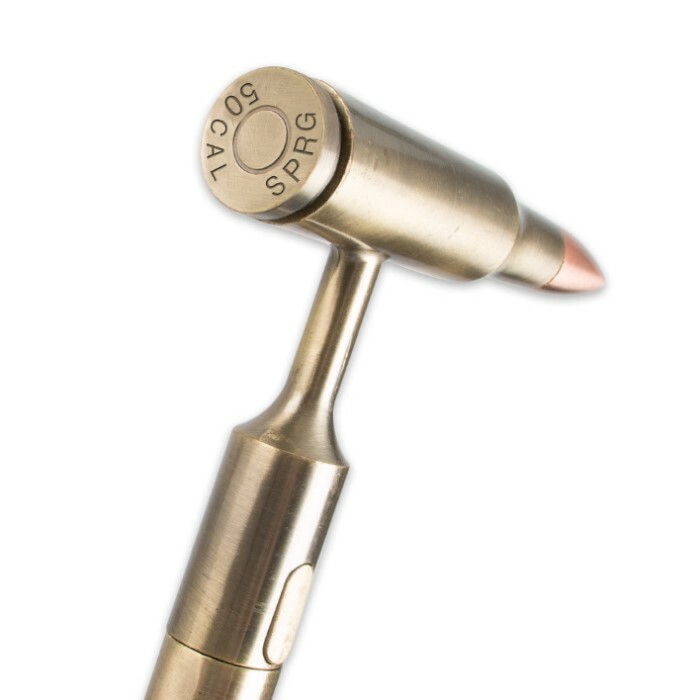 bullet-shaped handle with a copper-tone tip. It looks just like a .50 cal. bullet, giving you a unique new sword cane. A built-in blade release mechanism allows you to access the blade in a hurry, and the metal shaft features a sturdy rubber toe. The packaging didn't hold the cane very well and some of the "paint" came off. The blade can be sharpened and that is not a big deal. Didn't know that the stem of the cane was plastic. Hope it holds up. Might have to be a prop. You get what you pay for. This piece is every bit as good as it looks, and it's worth every penny. But the best part is the head piece/handle. First off, it's an exact replica of a .50 call bullet(5.45"). It's completely bronze and copper and surprising hefty. And here are the best parts the description ignorantly fails to mention: the copper bullet tip is very pointy, making it a more effective weapon as a hammer/pick. And the last and best surprise is that the round hammer head cap screws off, to reveal and open space big enough for 35 pennies. You can hide whatever in there, or like me, add 35 pennies to increase the hammer head's weight! 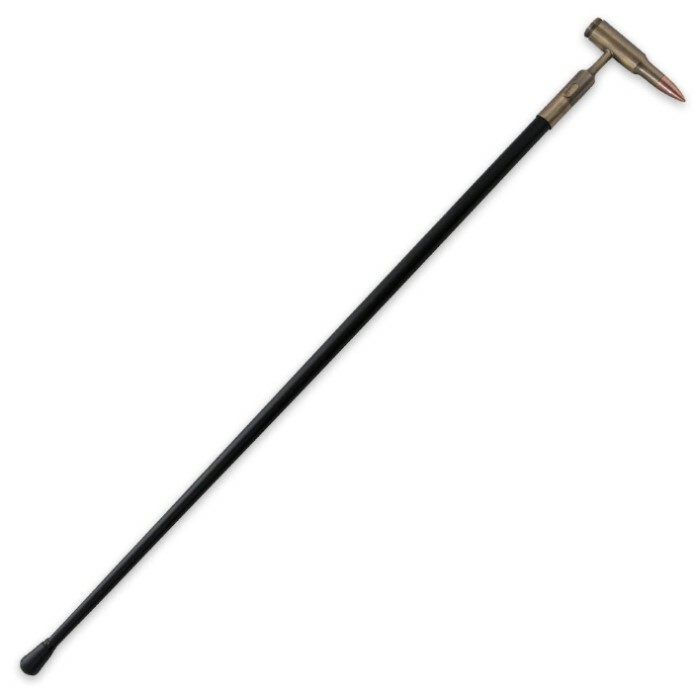 If you buy from this site, you MUST have this badass sword cane hammer, you will not regret it. I knew this cane would not be good as a sword because it's a lower quality stainless steel. I bought it because it's cool. It is cool however it's not very sharp which was unexpected and there was a crack in the handle. I'm not regretting my choice but I wish there was no crack.